London’s cycling revolution has arrived. I’ve been slowly filling in the consultation for what may be, according to Boris Johnson, the longest largely segregated continuous cycle route in Europe, the 18 mile East-West superhighway from Tower Hill to Acton. It’s one of two impressive and groundbreaking routes announced yesterday, the other being the North-South route from Elephant and Castle to Kings Cross. It’s a substantial document, the East-West route broken up into 18 sections, so responding to it in sections between doing other things is a good option. Responding, I’ll add, is a must for anyone who wants to see a better London, not just for people who want to cycle, but for London residents who don’t own a car; that’s 58% in Southwark, 63% in Westminster, 56% in Kensington and Chelsea. It’s not just about London, though: a healthy, pleasant city attracts people and business, and if successful there’s no excuse for UK cities not to follow suit. Each of the 18 sections shows staggering ambition for the bicycle: we’re talking traffic lanes given over to wide, two way, direct cycle routes segregated by kerbs, with priority over side roads and, at large junctions, traffic light phases which prevent vehicles turning across cyclists’ paths. Cars won’t be able to park in the cycle tracks, nor drive into them. Cycle tracks will bypass bus and coach stops. If plans are realised, what are now terrifying and unpleasant environments for even the most diehard of cycle commuters will be places people from 8-80 could ride a bike. What’s clear is these plans are unprecedented in the UK. They’re not even in the same solar system as what we have at present. Setting cyclists as equals on our roads, rather than the transport pariahs we have hitherto been regarded as in planning terms, is right. After all, in central London, people on bikes make up 24% of traffic. 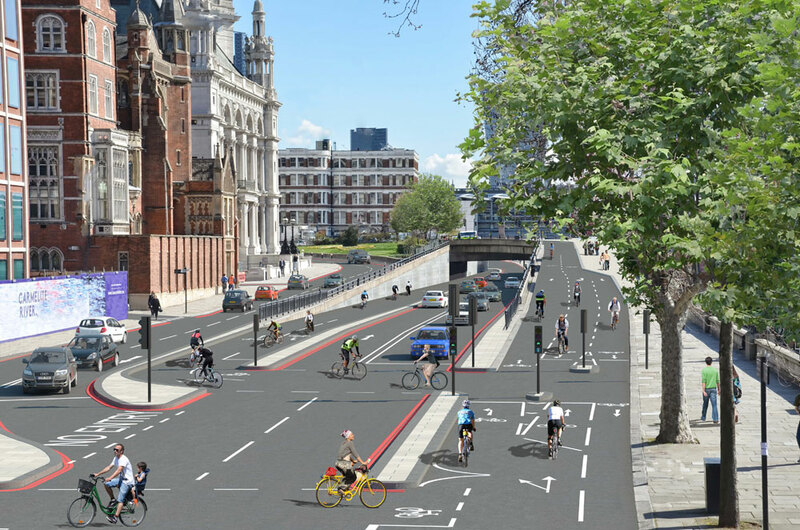 One of the slip roads from Victoria Embankment to Blackfriars Bridge will be given over entirely to cycling (see above). I’ve cycled this a couple of times recently and it currently feels like a motorway slip road. Perhaps more terrifying is the journey through the tunnel underneath the Blackfriars junction, which people do ride through. According to diagrams the new two-way cycle lane will continue through the tunnel, a segregated two way route replacing two lanes of motor traffic, one in each direction. This is an exciting time for the bicycle as a mode of transport. The scale of Boris Johnson’s and Andrew Gilligan’s ambition in London is staggering. It’s just two months since the high-quality Vauxhall gyratory route was announced, planned to be in place by October, and two weeks since Elephant & Castle designs were released, though the latter were received with less enthusiasm. Even campaigners are hailing the new cycle superhighways as a success. These are people who, rightly, are critical of infrastructure they see as substandard. After all, and not least for cyclists, poor infrastructure can have lethal consequences. So why should you support these plans? There will no doubt be plenty of people who want to keep the status quo, or who fear transport armageddon from reallocating road space away from cars. However the fact is, if we give people the option to cycle, they will. Conversely if we build more roads, more people will drive. Anyone who wants to see less motor traffic, cleaner air and less noise pollution and safer, more pleasant street environments should show their support and respond to the consultations. If realised, they will open new opportunities for those who cannot afford to or don’t want the inconvenience of driving in London, and for whom public transport is becoming too expensive. What’s more, if London can do it, the rest of the UK can.